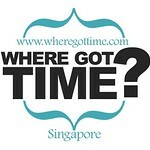 Where Got Time Singapore - Your Personal Assistant, Errand Runner & Concierge Service: Where Got Time? Time is an intangible asset. Once lost, it’s never replaced. It’s always a worthy investment in devoting quality time into your career, family and social relationships for overall wealth, health and wellness. Like it or not, people work round the clock with limited hours each day. The demands of today’s modern lifestyle barely leaves us enough time to accomplish everything. While some saddle between obligations, some need things done systematically, others require the flexibility of time to deal with critical matters. Before the ever-competing list of priorities deprives you of time to enjoy the fruits of your labour. Outsource these tasks to level your stress for more productivity. Where Got Time provides concierge service to busy individuals and professionals in Singapore with a variety of assistance services ranging from errand running to personal shopping for more focus in life.